The core of our product line, the USB VINT Hub has 6 VINT ports allowing for endless possibilities for USB sensing and control. 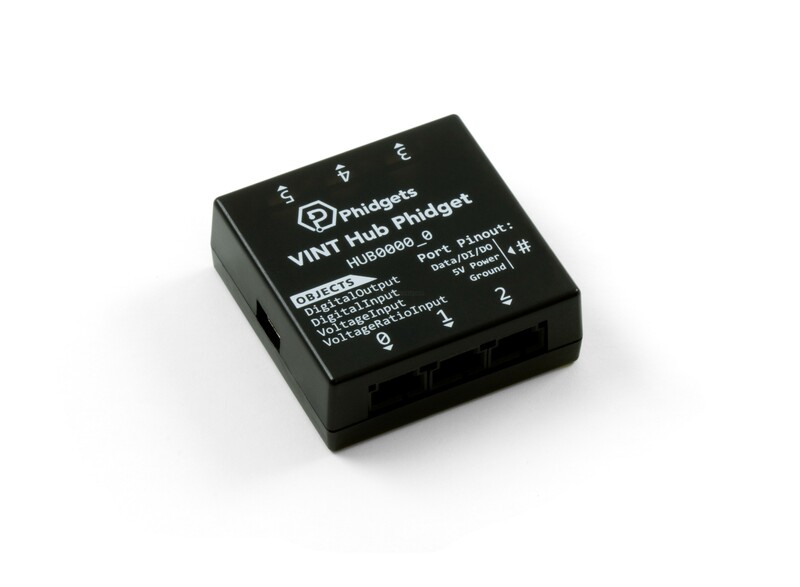 With a VINT Hub Phidget, you can interface six devices to your computer through a single USB port. Each VINT port can perform one of four roles: Communicating with an intelligent VINT Device, reading a 0-5V Voltage or ratiometric sensor, acting as a digital output, or reading switches as a digital input. Each port has a power and ground pin, so you can also use the ports to gain access to the USB voltage supply directly. 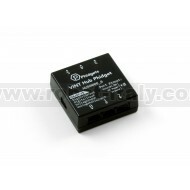 Plug in one of our many VINT-enabled Phidgets that perform a wide variety of functions. Control motors and LEDs, measure temperature or motion, or build a large scale system with many inputs and outputs. 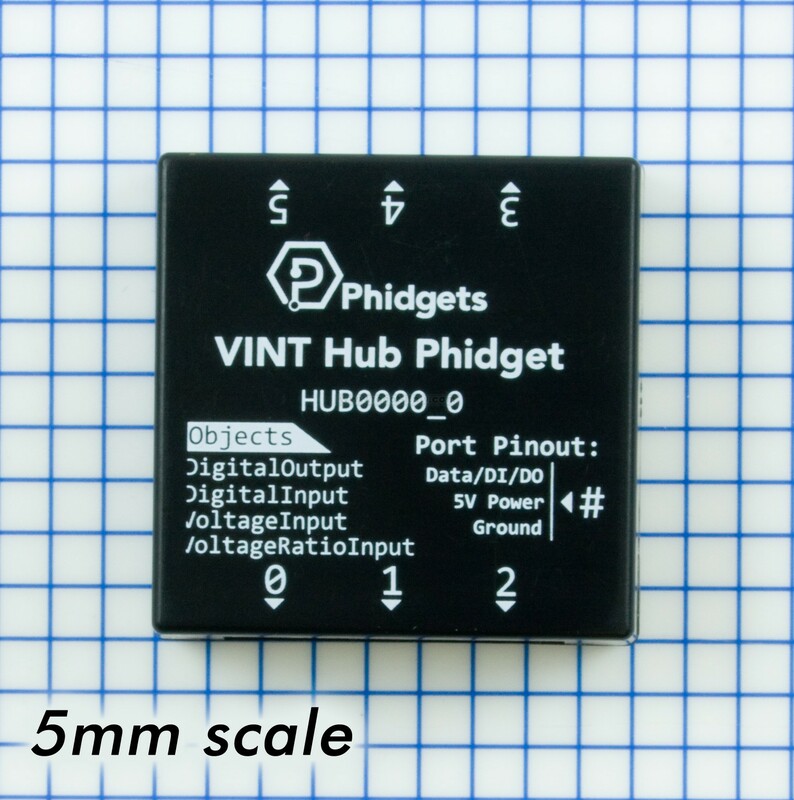 VINT Devices are 'plug and program': automatically discovered by the Phidget API with the same ease of programming you've come to expect from Phidgets. Each VINT device has a full API with functions and events to make programming a snap. Sometimes, you just need a few simple analog voltage sensors. Luckily, your collection of Phidget Analog Input sensors is not obsolete; each port on the USB VINT Hub can interface a 0-5V sensor. The VINT Port is backwards compatible with both ratiometric and non-ratiometric Phidget analog sensors. In digital output mode, a VINT port can be used to drive LEDs, relays, digital circuits, and other simple electronics. Each port is PWM-enabled, allowing you to dim LEDs to a specific brightness. Wire a switch or sensor contact directly into a VINT Port, and use the Digital Input mode to read the state of the switch. If you need more than six inputs or outputs, you can expand by attaching a VINT I/O module. For example, there are VINT digital output modules with 16 outputs, allowing 96 digital outputs on a single VINT HUB Phidget! See the "Compatible Products" tab for a list of modules. *Voltage measured with a 10-bit ADC, oversampled to 16-bits. Produce a voltage from -10 to +10 volts with this isolated voltage output module. Add 4 isolated active-high digital inputs to your hub at the cost of only one VINT port. Add 16 isolated active-high digital inputs to your hub at the cost of only one VINT port.